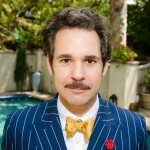 Remember how much fun we had last time Paul F. Tompkins graced the chartlands? We simply had to have him back to discuss summer songs, cable television (not movies!) and for a sumptuous game of roulette. Paul climbs off of his icy sofa to favor us with his thoughts on M&M ads, The Earwolf Challenge, and Math Rock. You know, all the regular discussion topics. Go to Earwolf to hear what our suit expert thought of Kim Kardashian’s wedding and to pick up the brand new ultra-hot Who Charted? t-shirt!